Stachybotrys chartarum (atra) or “black mold” is the most dangerous household mold among the over 200 types of mold that can be present in a home. Black mold is responsible for what has come to be known as ‘sick building syndrome’ and is the proven cause of residential deaths in several cases. Has the danger of black mold been exaggerated and overblown by the news media or is it really the immediate and severe danger it appears to be? The answer to that question is yes. Black mold can be deadly. Stachybotrys chartarum also known as Stachybotrys alternans, Stachybotrys atra and Stilospora chartarum. Regardless of what it is called, this is black mold and it can live in grain and soil, but it loves to live in damp construction materials such as those used to form the walls of buildings. Black mold loves these materials rich in cellulose. This mold was first discovered in 1837 in the walls of a house in Prague. Mycologist August Carl Joseph Corda discovered and described it for the first time. It particularly likes wallpaper, drywall and any wet material made with gypsum. What Makes Toxic Black Mold So Dangerous? Many different types of molds can cause severe health issues, including respiratory, flu and fever symptoms and hay fever. The difference with Black mold is that like many other molds it produces mycotoxins – a chemical that can cause many types of illness and even death. When the spores from Black mold are released and sent airborne, these mycotoxins can be absorbed by people and animals through the skin, through ingestion and through inhaling them. Both people and animals react to these mycotoxins with anything from a simple cold to headaches, fever, malaise, dermatitis, sore throats, fatigue, nose bleeds, rhinitis, dermatitis, sometimes hair loss and even death. People who die from exposure to Black mold due so from bleeding in the lungs or pulmonary hemorrhage. A research study done in Cleveland, Ohio in the mid-90’s showed that infants who lived in homes that had very high incidents of Black mold died from pulmonary hemorrhage. These toxins suppress the immune system and can cause liver or kidney cancer. There are several different strains of this mold and it is thought that some of them also produced trichothecene mycotoxin- Satratoxin H. This toxin is poisonous if it is inhaled. 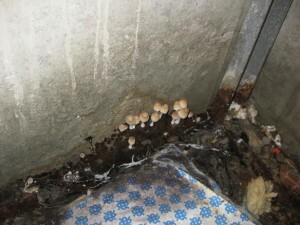 The spores that are produced by Black mold carry this toxin. Black mold grows slowly but relentlessly inside the walls of the building. It is often not seen until there is a major infestation. It also requires at least 55% humidity to thrive. All of the physical symptoms caused by Stachybotrys chartarum (atra) are labeled in the medical community as pneumomycosis. Even dead spores from Black mold can be dangerous and cause the same problems. These medical issues related to Black mold have been known since the 1830’s after the mold was first discovered. The first reported case of any animals or pets to be affected by this mold was in Florida when two pet cats died while having their teeth cleaned a routine procedure. Soon after, an inspection of their home produced an infestation of Black mold. Then blood tests were taken from the deceased cats and toxins from Black mold were found. The cats died from pulmonary hemorrhaging. The US Centers for Disease Control do not feel that just the presence of this mold in your home or in a building you frequent is a cause for panic. They believe the mold should be tested and professionally removed but that the building is then still habitable. Five Boro Mold Specialist Inc., a Brooklyn mold inspection, mold testing, and mold removal company in NYC, has been serving the NYC metropolitan area for roughly 25 years. Specializing in non invasive high tech mold inspections, “conflict free” mold testing, and rapid mold removal services. What Makes the Home a Great Place for Mold Growth? Does your home need mold treatment? DIY mold removal or hire a professional?